This is the THIRD Halloween Daniel and I have had together. 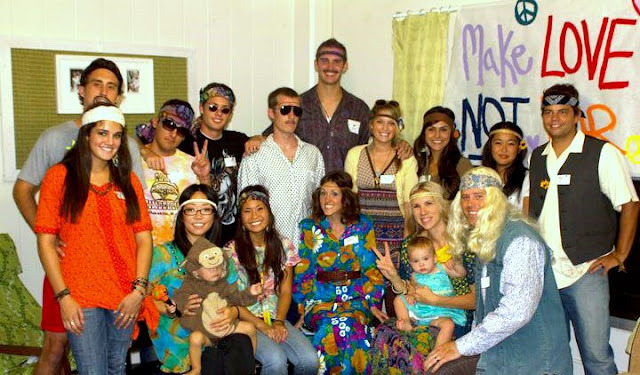 We went to a sixties themed murder mystery party. After two years of reconstruction, the Laie Temple is finally reopening. The open house starts this Friday and will be rededicated November 21. Can't wait. Beware of the Laie Lady. She lives in the Haunted Lagoon. She is in search for her killer and her missing children. Nothing will stand in her way. If you happen to see her, just remember... DON'T LET HER SEE YOU. through the Haunted Lagoon. It was the perfect way to start off the October holidays. I must admit that it's a little weird not seeing the leaves change color and not feeling a change in temperature. It confuses me. Sometimes I forget that it's fall time. Aaaaaaaaah! We were so scared. WE SAW THE LAIE LADY. She spotted us in the canoe. Very quickly, she made her way towards us. She jumped into the water, snuck up behind the canoe, then tried to grab and pull us all under! Luckily we got away, but we soon found out that she wasn't alone. 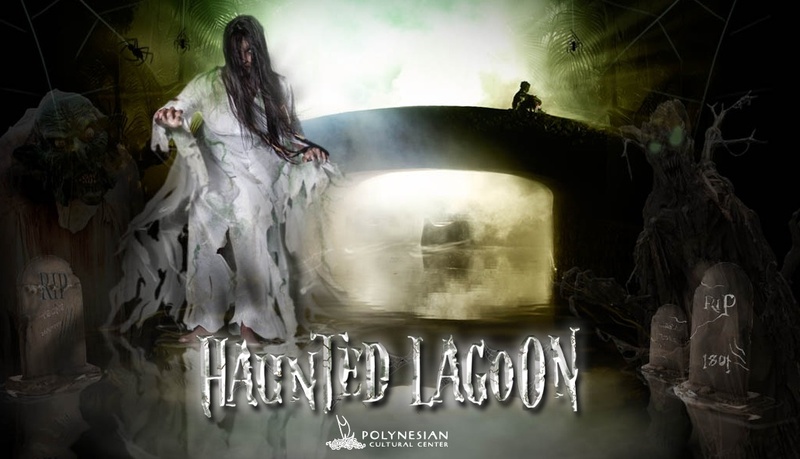 She had many spooky friends hiding in the Lagoon with her! Just a few reasons why I love Hawaii. 1. It's Hawaii. Need I explain more? 2. People really do wear Hawaiian shirts here, not just tourists. They're everywhere. 3. I can go to the beach anytime I want. 4. Shaved ice is definitely popular here. You haven't tried a real shaved ice unless you get one with ice cream on the bottom, sweetened condensed milk drizzled over the top, then topped with whipped cream. Heavenly. 5. Roaming wild chickens are a very common sight. Beware, if you have food they may attack you. I've seen this happen. 6. I never have to put on lotion, use chap stick, or condition my hair. 7. The local people greet each other by saying, "How's it?" 8. There are people from all over the world who live here, which adds such a variety of cultures to our community. It is one of the things that I love most about being here! 9. Food. Food. Food. Everything tastes good. I love trying new things. 10. We live 3 minutes (walking distance) from the temple. How lucky is that? 11. Everyone here has tattoos. Ok, maybe not everyone, but seriously, soooo many people do. I've never seen so many people with tattoos in my life. (I've recently started watching LA Ink. I think about that show every time I see someone with a tattoo). 12. I will NOT miss the snow. I will be perfectly content if I never see snow again. Is Hawaii the perfect place for me? Yes. Absolutely. 13. Everyone here is laid back. Really really laid back. You wouldn't understand unless you've experienced it. 14. People walk around in stores without their shoes and/or shirt ALL the time, and it's perfectly fine. 15. Jack Johnson lives somewhere near here. I don't know where, I just know he's close. I will find him someday. 16. Having a sun kissed glow to your skin all year round is pretty awesome. 17. I get to wear flip flops all the time, which is great because I don't really like wearing real shoes anyway. 18. Hawaii is the perfect place for taking photographs, which is great for obsessive picture takers like myself. 19. The people here are so warm and friendly. 20. I want to learn how to hula dance and play the ukulele. 21. I am never cold here. The only time I am cold is when I am at work and the air conditioning is blowing full blast. Look who came to see me. She was on vacation here with her family. We got to meet up for lunch. It was just great. Thai Food. But mostly just Opal Thai. This awesome truck stand sells the BEST Thai food I have ever had. We were originally introduced to this place by Alden and Ashley. Thank you thank you. Our lives have been forever changed. Daniel never wants to try anything new on the menu because he loves the usual so much. We went with Chad, Megumi, & little Noa. So glad this cute family is finally here in Hawaii with us!